Booyah Baits are becoming more and more popular among Anglers as they use them. Right now we have a limited selection in stock but will be adding differnt varieties before the Spring Fishing Season gets underway, so check back later to see what is being added. Booyah Baits Chartreuse/Black Buzz Bait. 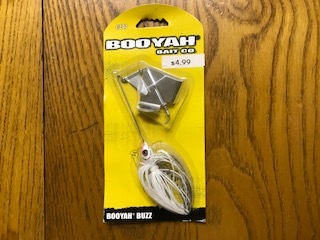 Booyah Baits White/Red Buzz Bait.